So, I'm on this quest to be healthy, to lose weight and you know, get fertile.. eventually. And as well forcing myself to visit the gym a whole lot more, I've decided to learn to cook. I bought a few cookbooks I'd read good things about - and I picked a few of the first recipes in the book, and off I went. The first recipe? Fish. I should preface this by saying I hate seafood. Seafood including fish. The only time I'll eat fish is if it's battered and with chips, in the traditional English pub fashion. Other than that? Nope. Never. Yick. The thought of it makes me gag. The boy always makes fun of me but seriously, the thought of eating fish freaks me right out. Even just the smell of seafood. And don't even get me started on the bones inside, because that just creeps me out. 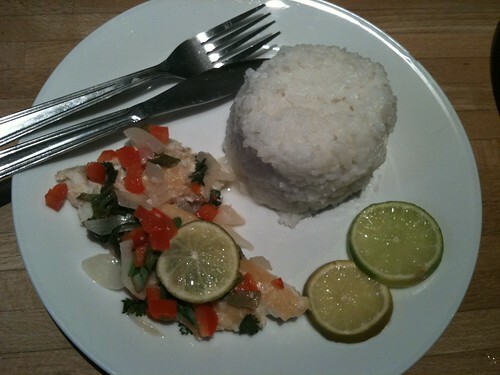 So, here's a quick picture recap of my first adventure into cooking - Smoked Haddock parcels with Coconut Rice. 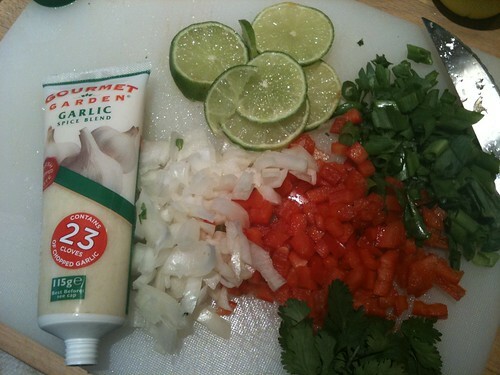 Ingredients. 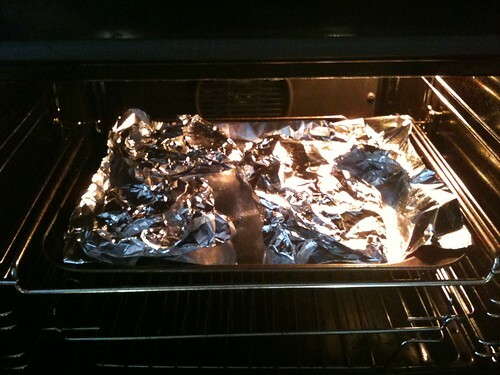 Except for the foil. You can't eat that. Or you could; it's got no calories? This is me. With fish. I'm actually standing about a metre away from that board, trying not to puke. As much as I dislike most vegetables, I love how they look chopped up. Colourful! Fish buried in vegetables. And lime for flavour. Wrapped up and all ready to bake. 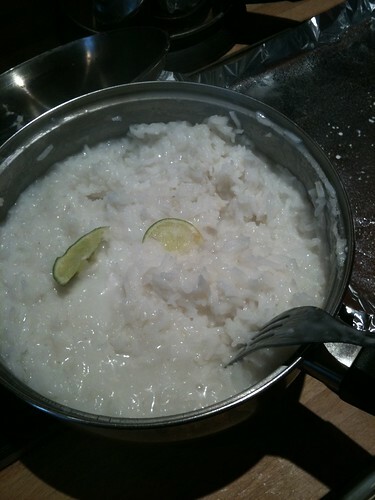 And while that was baking away, I made coconut rice. 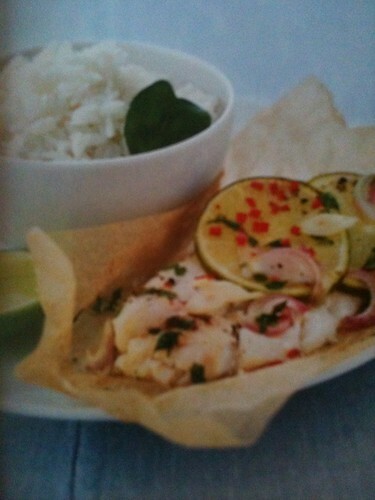 This is what the picture in the cookbook looks like. As for the verdict? Well, my rice was pretty freaking amazing, if I may say so myself. Except, as I do, I cooked way too much of it and we ate coconut rice for the next two days, so I don't really want to eat it again soon. As for the fish? Meh. It still tasted like fish, just fish with veggies on top. It wasn't awful but it wasn't great. It wasn't even good. It was just, meh. Jase liked it, but I think I'll have to face it. I just don't do fish. Have you got any sure-fire easy recipes that this beginner-cook can handle? This entry was posted on 00:29 and is filed under Aly Learns to Cook . You can follow any responses to this entry through the RSS 2.0 feed. You can leave a response, or trackback from your own site. That looks pretty good, especially the rice! I'll have to try coconut rice sometime, never have. SALMON, girl! A) it's easy to cook, because you can do it any number of ways including grilling easily, and B) it hardly smells or tastes anything like typical fish. It's very much more like cooking a steak than cooking fish and ends up with a much heartier flavor. My recipes are always off the top of my head so find something out there on allrecipes.com or similar that has a high ranking and give it a shot. Wow, I can't believe you tried fish as your first attempt when you don't even like fish! You are brave. If you're a fish hater, I'd definitely try a more neutral fish! Fresh salmon won't have a fishy taste. 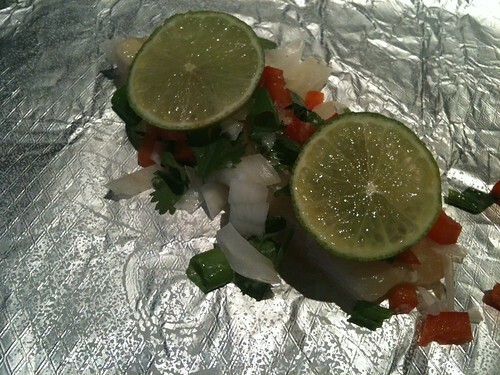 Fish like talapia (a white fish) is quite neutral - it's one most fish haters like. Yum on the coconut rice! Curtis Stone is doing a great range of recipes with Coles here in Australia, feed your family (of 4) for under $10AUD. Most of the recipes are super easy and extremely tasty. I just made the lemon chicken and rice soup - it was really tasty. I also love many of the recipes that you can find on the Nigella Bites shows. They play them a lot over here as we have a 24/7 cooking channel on foxtel. The bites are quick and easy recipes which are very tasty. She has a lot of recipes on her website too. I personally am not a big fish fan myself at all. 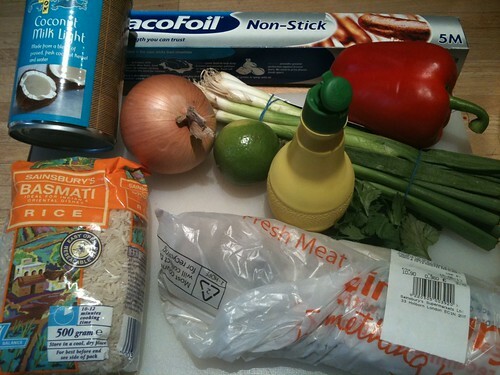 You can change that up just by changing the vegetables and the stir fry sauce. EG try snow peas and carrots, or broccoli and cauliflower. You can also change from chicken to beef to pork. I never was a big vegetable fan however I have found the more you eat them the more you grow to like them. There are a lot of great recipes on the taste site, too. Snosk, that sounds like what Jamie Oliver does over here - feed your family for a fiver. I might go get some cards of his and see what I can come up with. Still a little scared about salmon but worth a try, right? I don't eat fish either, and despite my plans of losing weight, I have no intentions of starting to eat fish or seafood. Anyway, is there any chance you could post that coconut rice recipe? Because that sounds really really good. Cook 1 lb or so (2-4 depending on size) of boneless, skinless chicken breasts in a uncovered, shallow dish, with your choice of sauce (bbq, thai, curry, whatever) spread on top and about 1/4 to 1/2 up the breasts for 20-30 minutes at 204 degrees Celsius. You can also cook them with a wipe of olive oil (or a good coating of cooking spray) and shaking on some seasonings to use in casseroles or chicken salad, or to top a green salad. If you use marinara sauce, you can also top with cheese for the last 2-5 minutes and serve with spaghetti noodles as a "Parmesan." Add a salad with a light dressing and you have a full meal with double veggies (marina totally counts!). Not gourmet, but easy and depending on the sauce, low fat as well. Oh LOL. My eldest has just moved out of home *sob* and I am compiling a list of recipes for her and making it into a blog for easy reference. Cause that kid can burn TEA. I am thinking you are waaaaaaay ahead of her babe, cause it does look yum. Fish is one of those awesome ingredients that doesn't taste too much like anything on its own - you can customise it with whatever flavours you like. Go for a mild fish like dory or basa (if you can get it) or even try tuna because apparently it feels and tastes like meat rather than fish. You crack me up. Immediately cooking something you hate. I'll have to get back to you on the recipes. I know I have some easy ones, but dredging the brain late at night is not the most fruitful. I think I may need to procure this recipe and give it a go! Oh MAN. I love coconut rice!!! 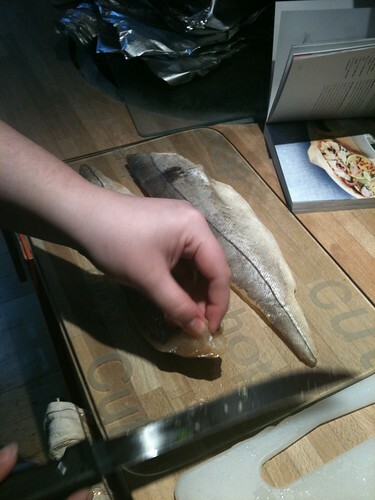 I'm in awe of you cooking fish as your "kick-off" recipe! It took me a long time to work up the nerve to try fish. I hate fish too. It's awful. I HATE fish. I can't stand the smell and the way it looks and oh my goodness I just HATE it. Kudos to you for trying!